The Motherwell Times understands that English Championship sides Birmingham City and Preston North End are weighing up £650,000 offers for Motherwell striker Louis Moult in the January transfer window. Both teams had scouts watching Moult during Sunday's 1-0 home defeat by Aberdeen, which ironically marked the first time that the Steelmen had failed to score in 13 competitive matches this season. Moult (25) loves life at Fir Park where he is idolised by supporters. But he has so far refused to sign a contract extension at Motherwell - which would make him the club's highest paid player - ahead of his current deal expiring next summer. The Fir Park board earned deserved praise from 'Well fans by rebuffing a near £400,000 bid for Moult from Aberdeen this summer, with Rangers also interested in signing the hitman. And it now appears that the Fir Park hierarchy's resolve will be even more strongly tested in January, with English outfits apparently easily able to 'gazump' Scottish teams by making higher bids than those already posted for Moult. The Motherwell board face having the painstaking decision about whether or not to accept a significant offer for a player whose contract is running down. And, if Moult is allowed to go, the Fir Park outfit would likely have a massive job on their hands bringing in an adequate replacement. English forward Moult has been a roaring success since joining Motherwell from Wrexham in a cut price deal in summer 2015. 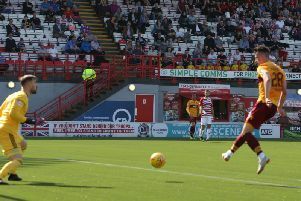 He scored 18 goals for the Fir Parkers in each of his first two seasons and has netted a further nine during this campaign to help Motherwell into the Betfred Cup semi-finals and a top six berth in the Scottish Premiership. Moult's love for Motherwell and the fact that he's playing first team football every week may yet see him sign a new deal at Fir Park and spurn the riches on offer down south. The recent transfer of his former 'Well team-mate Ben Heneghan to Sheffield United - for whom he is yet to make a competitive first team appearance four weeks after joining - could be considered as proof that the grass is not always greener when a player moves to a so called bigger stage.